There are various things that can cause low milk supply in breastfeeding, but do you realize that some supply problems originate from things that you do? Here’s some common mistakes Mom’s make in the early days that may cause low milk supply issues. Different babies may have different feeding schedules due to a difference in moms’ breast storage capacity. Additionally, different babies have different nursing patterns. Some babies are super-effective feeders, who can empty a breast in just 10 minutes. Whereas others are more laid back and take their time to finish their milk. 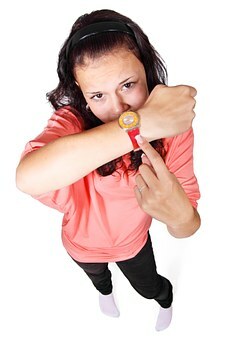 Nancy Mohrbahrer, IBLCC gives a clear example in her recent article about clock-based feeding. She was checking the progress of two newborn babies (less than 1 week old) on the same day. One baby actually needs 10 minutes to get 2 ounces of breast milk, whereas the other needs 55 minutes to get exactly the same amount of milk. Look at this! 10 vs 55 minutes for the same amount of milk! If the second baby is forced to finish his feed after 10 minutes, he will get very little milk and will be hungry all the time. So again, remember to feed the baby based on his cues, not based on the clock*. *Exception to be made is if your baby is too weak/sleepy, you need to wake him up more often, e.g. 2 hourly, to get him fed. I can totally relate to a postpartum mom needing a lot of rest. I recall the early days with my newborn being the most sleep-deprived phase of my life. However, you need to know that your baby needs to nurse very frequently (most suggest every 2 hours in the first few days). At night, he may sleep a little longer (perhaps a 4-hour stretch), but don’t skip his feeding. When you sleep together with your baby, you are more alerted the moment she’s rooting as the first sign of hunger. You don’t even need to get down from your bed and take the baby from the crib to start nursing. Less energy spent. With my first baby, I ended up sleeping on the couch the first month after he was born. He was so clingy and nursed a lot at night, and yeah, he always cried the moment I put him down in the crib. With my second, I started sleeping with her right after birth. I learned side-lying nursing right in the hospital, so I can ask the nurse whenever I faced difficulty. Once we were back at home, I still spent a few days nursing her in sitting position at night. But by day 3 onward, I could lay down and sleep while nursing her at the same time. It is easy to get worried if your baby is really getting enough milk from you. After all, with breastfeeding, you cannot really see with your eyes how much milk your baby gets. This could be even worse if there are other family members with lack of breastfeeding knowledge push you to supplement feeds, just because your baby cries too often. Whatever the reason, unnecessary supplementation affects your milk supply negatively. 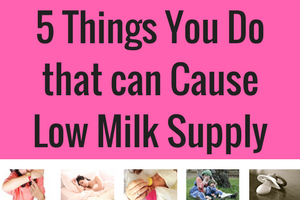 This is because the more times you supplement, the fewer chances your baby has to remove milk from your breast. When your breast receives less stimulation, it signals your brain to produce less milk. And if you continue to do this, don’t be surprised if your milk supply drops in a matter of days. When you are the only one managing your household, it is easy to delay nursing just because you can finish just ‘one more thing’. And these ‘things’ get multiplied, and without knowing, you have missed one feeding session. 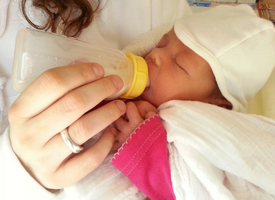 Here are some tips to manage the household while nursing a newborn. >> Realize that your newborn needs you the most, so prioritize your newborn for the first 2 weeks. Take a babymoon for these two weeks (this is when most important part of milk production stage is happening in this time) and focus on nourishing your newborn and yourself. >> Accept help from everyone. Whether it is from your spouse, parents, neighbors, anyone. Take out dinner? Yes, please. Babysit your elder children? For sure, please bring them to the park for a while. Folding the laundry? Oh, yes.. for sure. This is NOT the time of being “that perfect mom” who always has her house spotlessly clean and dinner ready all the time. Please, help yourself and your baby by accepting help from others. If you can’t get easy access to help, prepare way ahead. Perhaps it’s freezer meals for the first few weeks. Some quiet time activities for big brothers. Or use paper plates and disposable spoon and fork so that you can get away from washing dishes. >> Learn how to nurse in a baby carrier. When all else fails, your cooking’s not done yet or your elder child badly needs your attention, I’ll wear my baby using my favorite baby carrier and nurse her in it. It takes some time to master this skill, but once you are expert in it, you’ll be amazed at how easy it is to breastfeed while multitasking. I personally love using a short wrap (rebozo style), but I understand different mothers have different preferences. For the newborn phase, a stretchy wrap like Boba and ring sling are popular choices. Have you ever heard this kind of comment when your baby constantly nursing at your breast? Frequent nursing is often regarded as pacifying with the breast. But the truth is this is your baby’s way to tell your breast to produce more milk. If a baby has limited access to the breast and is given a pacifier instead, your baby cannot tell the mother to produce more milk. 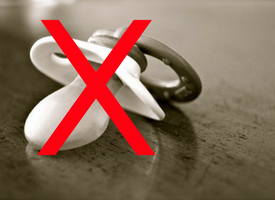 So, please stop giving your baby pacifier in his early days. Let him tell you whether he needs more milk by nursing at your breast. I hope this article helps you to understand what you should / should not do in your early breastfeeding days in order to have a good milk supply. 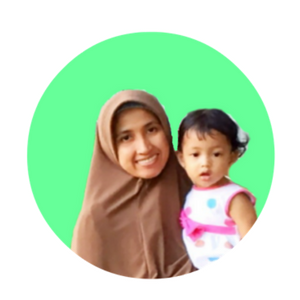 Rina is a mom of two who once struggled to breastfeed her babies. Her low milk supply issue has inspired her to help other moms preparing for breastfeeding and pumping breast milk. Check out Rina’s writing at Living with Low Milk Supply and grab your FREE Breastfeeding Checklist while you’re there. Totally agree with this. 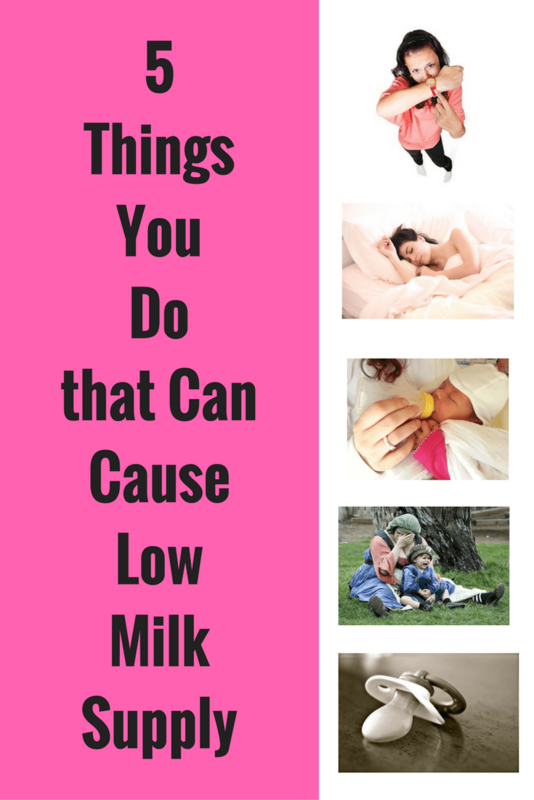 A lot of moms think they have low milk supply issue and slowly stop breastfeeding. The truth is, even when you are mixed feeding with both breast milk and formula, you are still breastfeeding. And, no matter how little breast milk you give to your baby, it’s still very beneficial for their immune system. As for medication-wise, I highly recommend checking every medication in lactmed / e-lactancia database. Often, doctors give a precaution to not breastfeed your baby, when in fact, the risk is very low. Nursing my babies as newborns was always very stressful for me. If I ate well and slept properly I always had a good supply of milk. However, if I didn’t eat or sleep properly my milk wouldn’t be as good which resulted in the baby being up at night and it ended in a vicious cycle which was hard to get out of. I enjoyed reading your tips and I’ll keep them in mind for next time! Thanks for your lovely comment Hollie. I’ll make sure Rina receives it. Ooh… so there’s going to be a next time? Another baby on the way? Wishing you all the best. Rina here. I can totally relate to what you said. If I don’t get enough sleep, my supply suffers. That’s why having a good rest is important! All the best for your next breastfeeding journey! I’m still breastfeeding my 11-month-old and I have found through experience though no scientific evidence that a mother’s diet is a huge factor in milk supply. at one point I felt the pressure to shed some pounds so decided to engage in a ketosis diet needless to say my milk supply greatly decreased anyway long story short. I promptly abandoned the diet and loaded on the carbs and it was like the floodgates were open and back in business. so I just thought that it might help to load on the carbs to increase supply. Even though there’s no scientific evidence that mother’s diet can affect the milk supply, moms still need the ‘calories’ so to speak. So yes, better not to go dieting so soon, especially if your baby is still relying a lot on your milk.